Coming in to the season their was talk surrounding the FAU program that this defense had the potential to be the best in FAU history. On Saturday afternoon the defense ended up on the wrong side of history. Nebraska blitzed FAU 55-7, as the Owls surrendered a school high 784 total yards in Charlie Partridge's first career game as FAU head coach. The Owls were unable to stop the run, as the Huskers gashed the defense for 498 rushing yards with Ameer Abdullah doing the most damage, amassing a career high 232 yards, on 21 carries with one touchdown. Nebraska's offense set the tone for the game as they marched down the field with a 13 play, 86 yard scoring drive on their first possession. Quarterback Tommy Armstrong Jr. capped off the drive with a five yard touchdown run. The Owls quickly responded with a scoring drive of their own, needing 11 plays to go 75 yards down the field. Lucky Whitehead was able to take a screen pass from Jaquez Johnson and spin his way across the end zone for a touchdown tying the game at seven midway through the first. From then on out Nebraska dominated, scoring 48 unanswered points. The Huskers averaged an impressive 8.6 yards per rush, as Terrell Newby added a career high 107 rushing yards to give the Cornhuskers two tailbacks over 100 rushing yards for the game. Tommy Armstrong Jr. also achieved a career high in passing yards with 271 yards and two touchdowns for the day. While the defense was out manned up front, the offense was in just as much disarray.The Owls finished the game with 200 total yards with 75 yards coming on the first drive. In the third quarter, the Owls failed to gain a first down. For the majority of the game, Nebraska was without star defensive end Randy Gregory. "He probably could have gone back in the game, but we decided not to," said Bo Pelini. Junior Jaquez Johnson went 6-12, with 61 passing yards and one touchdown before leaving the game in the second quarter with a left shoulder injury. Sophomore Greg Hankerson struggled in relief, going 5-18 with 38 yards. Johnson and senior corner back D'Joun Smith both went down with injuries. "Early prognosis now is there will be a very good chance they will be back with us next week," said coach Partridge regarding the injured players. Two bright spots for the team was the play from seniors Jay Warren and Lucky Whitehead. 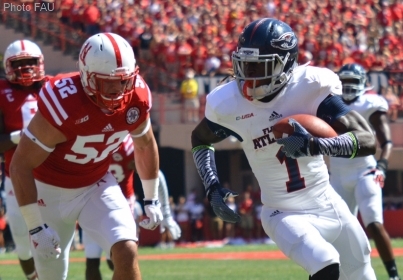 Warren finished the game with 77 yards on 14 carries, while Whitehead (photo) was great on kickoff returns, averaging 35 yards a return to go with scoring the Owls' lone touchdown. After talk all summer about an explosive offense and a potentially great defense, its back to the drawing board for the Owls. "Certainly disappointed with the results and some of the things we did on the field," said Partridge. "There were times it looked like we had a powerful offense and times it looked like we needed to improve," said Partridge. "We just need to continue to get better as a fundamental football team." The Owls will need to improve in a hurry. Next week they travel to Tuscaloosa to take on the Alabama Crimson Tide.